Hello and Welcome to our preview for Dhaka Dynamites vs Chittagong Vikings match. 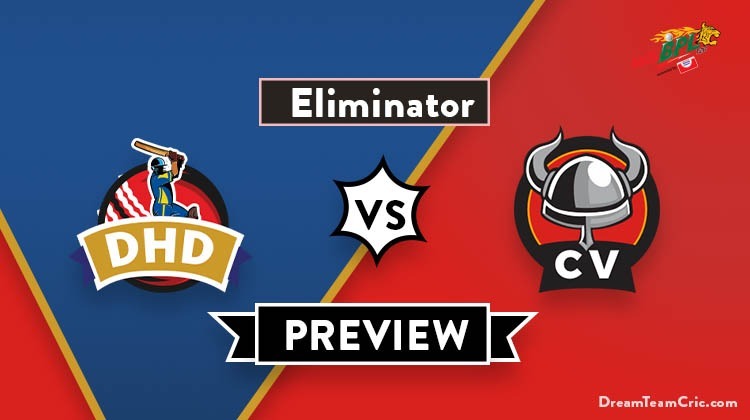 We are Covering DHD vs CV Dream 11 Team Prediction, Preview and Probable Playing XI for the Bangladesh Premier League 2019 match. The match is to be played at Shere Bangla National Stadium, Dhaka. Dhaka Dynamites ended fourth on the points table with six wins and six losses. They won their last match against Khulna Titans by 6 wickets. Bowling first, Shakib and Russell took two scalps each to restrict Titans at 123. Upul Tharanga along with Narine and Nurul ensured comfortable chase of the target. They will hope to put their best performance tomorrow against Vikings. Chittagong Vikings ended third on the points table with seven wins and five losses. However, They lost their last match to Sylhet Sixers by 29 runs. Bowling first, Newly recruited Hardus Viljoen took four scalps to restrict Sixers at 165. Chasing the target, Skipper Mushfiqur played a good knock of 48 runs and was supported by Yasir Ali and Mosaddek Hossain but were left behind by 29 runs. A unison effort will be required from all teammates tomorrow to defeat Dhaka Dynamites. A good match can be expected between both teams in tomorrow’s do-or-die encounter. DHD vs CV, Eliminator, Bangladesh Premier League 2019. Shakib Al Hasan (c), Sunil Narine, Kieron Pollard, Andre Russell, Rubel Hossain, Nurul Hasan, Rony Talukdar, Shuvagata Hom, Andrew Birch, Ian Bell, Qazi Onik, Mizanur Rahman, Asif Hasan, Shahadat Hossain, Mohammad Naim, Mohor Sheikh, Heino Kuhn, Upul Tharanga, Luke Wright. Mushfiqur Rahim (c), Abu Jayed, Sunzamul Islam, Dasun Shanaka, Sikandar Raza, Robert Frylinck, Mosaddek Hossain Saikat, Khaled Ahmed, Nayeem Hasan, Cameron Delport, Mohammad Ashraful, Robiul Haque, Yasir Ali, Nihaduzzaman, Najibullah Zadran, Shadman Islam. H Zazai left the Dhaka Team while Luke Wright has joined the Dynamites prior to the eliminator. Place of Mizanur Rahman is risky and Mohammad Naim or Mohor Sheikh can replace him. Shuvagata Hom is likely to come back in the playing XI replacing Mahmudul Hasan. Sunil Narine and Upul Tharanga can open the innings. Rony Talukdar, Shakib Al Hasan, Andre Russell, K Pollard and Nurul Hasan will follow them. Mohamamd Shahzad have left the Chittagong team. Hardus Viljoen is the replacement of him. Frylinck took part in training session on Sunday and batted in the nets at the academy ground so he is expected to play this match. Mosaddek Hossain suffered an injury during training and he will have fitness test just before the match. So he will be risky for this match. R Frylinck if fit will return in the playing XI replacing Sikandar Raza or Dasun Shanaka. Anyone among M Ashraful and Shadman Islam can play. C Delport will open the innings along with M Ashraful or Shadman Islam. Yasir Ali and Mushfiqur Rahim will follow them. Nayeem Hasan will lead the spin attack while H Viljoen, Abu Jayed and Khaled Ahmed will be the key pacers. C Delport can support them. Both teams are likely to field their best playing XI. Sunil Narine, Upul Tharanga, Rony Talukdar, Shakib Al Hasan (c), Mizanur Rahman/M Naim/Mohor Sheikh, Nurul Hasan (wk), K Pollard, Andre Russell, Shuvagata Hom/Mahmudul Hasan, Qazi Onik, Rubel Hossain. C Delport, M Asharful/Shadman Islam, Yasir Ali, Mushfiqur Rahim (c and wk), Sikandar Raza/R Frylinck, D Shanaka/R Frylinck, Mosaddek Hossain (if fit), Hardus Viljoen, Nayeem Hasan, Abu Jayed, Khaled Ahmed. If you liked DHD vs CV Dream 11 team prediction, then follow us on Twitter for Latest Cricket News and Grand League Teams.